“Is college worth it?” is a common question for many potential students. From a financial perspective, data indicates the answer is “yes.” According to a CollegeBoard report, the average graduate will earn enough to offset the cost of college by age 34. But in a market that encourages innovative business models and unconventional career paths, many wonder if it’s still necessary to get a four-year college degree to achieve success. There are the well-told stories of Mark Zuckerberg and Steve Jobs: outliers who turned their ideas into billion-dollar empires without a college degree. They are proof that there are many paths to success. For most people, the answer is still “yes.” More than just a piece of paper, a bachelor’s degree can arm you with knowledge, skills, industry connections, and hands-on experience that can completely change the trajectory of your life and career. But to answer the question “Do I need a college degree?” on a personal level, you must consider the benefits of a college degree compared to your personal, career, and financial goals. 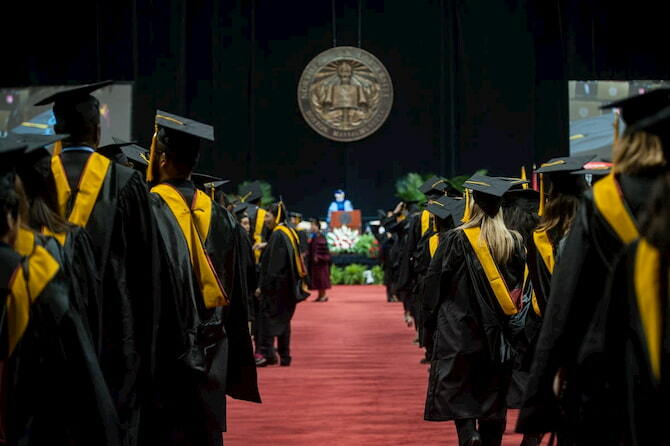 Continue reading to decide for yourself if earning a degree is the next step for you. A recent study by the New York Federal Reserve bank found that “investing in a college degree may be more important than ever before because those who fail to do so are falling further and further behind.” Think about where you are professionally, in your industry, function, and position, and consider where you want to go. Where do you hope to be in five years? 10? 20? How might a bachelor’s degree help get you there? College graduates have access to more job opportunities. Having a bachelor’s degree opens up rewarding opportunities that might have otherwise been inaccessible. College graduates currently see 57 percent more job opportunities than non-graduates and it’s estimated that, by 2020, two-thirds of all jobs will require a postsecondary education. Plus, when applying to positions, college graduates find jobs faster than non-degree holders on average—in 27 weeks versus 31. A degree will enable you to qualify for these additional opportunities and offer you more flexibility in where you choose to work. College graduates are more likely to be employed. According to Pew Research, bachelor’s degree holders have a significantly lower rate of unemployment than high school graduates. In 2015, eight percent of adults ages 25 to 34 without degrees were unemployed, compared to just two percent of bachelor’s degree holders. Pursuing a college education expands your access to opportunities by connecting you to a lifelong network of colleagues, advisors, professors, and mentors. Over the course of your career, this network can open doors and connect you to industry leaders with whom you can share ideas and explore new ventures. College graduates are more attractive to employers. Having a bachelor’s degree will keep you in demand as the need for skilled, college-educated workers continues to rise. It’s estimated that by 2020, there will be 13 million available jobs requiring bachelor’s degrees. Not only will a degree add to your credibility, but you’ll also gain skills employers are seeking, like communication, leadership, critical thinking, and problem-solving, giving you a competitive advantage. Some might argue that employers prefer hands-on skills to academic credentials. But the individuals with both? They have the real advantage. By pursuing a degree that offers experiential learning opportunities, like the internships and project-based work offered at Northeastern, you can show employers that you have best of both worlds: theoretical knowledge and the hands-on application in the real-world to back up your claims. College graduates report higher career satisfaction. Research also shows that having a bachelor’s degree leads to greater long-term job satisfaction. Sixty percent of bachelor’s degree holders say they are highly satisfied with their job, and view it as is “more than just a paycheck,” whereas 42 percent of high school graduates say their job is “just to get them by.” If finding long-term fulfillment in your career is highly important to you, a bachelor’s degree can help you find it. Will a bachelor’s degree make a difference in achieving your financial goals? The simple answer is “yes.” While taking a seemingly high-paying job offer may seem more enticing, over time, the benefits of investing in a college education will outweigh the costs. How? Earn more money in your lifetime. In 2015, full-time employed bachelor’s degree holders earned 67 percent more than those without a degree. This difference adds up significantly over time: On average, college graduates earn one million dollars more than high school graduates in their lifetimes. And the wage gap between college and high school graduates’ salaries is increasing over time. Today, adults with a high school diploma earn 62 percent of what their peers with bachelor’s degrees earn, compared to 77 percent in previous generations. Be more likely to be financially stable. According to Pew Research Center, individuals without a degree are three times more likely to be living in poverty. Currently, only six percent of bachelor’s degree holders live below the poverty line, while an alarming 22 percent of people without a college degree live in poverty. Earning a bachelor’s degree will help afford you economic stability and security for the future. Be more likely to receive retirement benefits. According to the U.S. Census Bureau, 52 percent of full-time workers with a degree were offered retirement benefits, compared to only 43 percent of individuals without a degree. Reflect on your values, and how you feel about pursuing an education. Has earning a college degree always been on your bucket list? If it’s something you’ve always aspired to, earning your bachelor’s degree will give you an ultimate sense of personal achievement and, in turn, can boost your sense of confidence and self-esteem. So, what’s stopping you? What’s keeping you from going after that degree? Question your objections. Are those voices in your head really telling you a bachelor’s degree “isn’t worth it?” Or is it that you really feel a college degree isn’t realistically within your reach? If you find yourself saying: “A college degree is too expensive…” The key is to know your options. If you already have a job, reach out to your human resources department to investigate your tuition reimbursement options. Over 83 percent of employers currently offer some type of educational assistance, with companies spending between $5,000 and $6,999 per employee per year, on average. There are also many financial aid options available, including scholarships, grants, and military benefits. Speak with an academic advisor who can walk you through your options and make your goal a reality. If you believe: “I don’t have time to go back to school…” You’re not alone. This is a common objection for those who want to earn a degree, but feel they cannot commit to full-time classes or their schedule is prohibitive to being successful. Balancing work, school and family is challenging, but others have done it—and so can you. The first step is to find a school that can flex to your schedule, offering part-time or online options that allow you to make your personal obligations a priority. Many online programs today are geared toward adult learners and are designed to meet the challenges you face, enabling you to meet your goals and continue to excel in other areas of your life, too. Are you convinced that pursuing your college degree is worth it? If so, we assure you, it’s within your reach. To learn more, explore Northeastern’s bachelor’s degree completion programs or get advice from an admissions counselor today.